You’ve probably heard about the new Note 7 poised to be released in the near future but did you know that it borrows a few major features from the “older” #GalaxyS7? Solution: Hi Mary. This issue is best supported by concerned parties like Yahoo, Samsung, or even your internet service provider. We don’t know what steps you took from our blog but you should know that there’s nothing much that we can do for you. You must work with the technical support teams of Yahoo or the developer of the app you’re using to get a resolution. It also worth noting that Yahoo has its own email app so there’s a chance that it may have no longer support third party apps like the one you’re using. We can’t confirm if this is a factor or not but it may be worth mentioning when you seek assistance from them. Also, some email service providers like Microsoft or Google may not allow a user to configure an email account to another app if two-step verification or similar security feature is enabled. Make sure that you disable all security features on your Yahoo account before attempting to configure it in your email app. Solution: Hi Mark. We covered possible causes of SD card corruption in this article: How to prevent Galaxy S7 losing data stored in SD card. Make sure that you go over the short discussion to prevent or minimize SD card issues in the future. Step 1: Turn off your Samsung Galaxy S7 Edge. Step 2: Press and then hold the Home and Volume UP keys, then press and hold the Power key. NOTE: It doesn’t matter how long you press and hold the Home and Volume Up keys, it won’t affect the phone but by the time you press and hold the Power key, that’s when the phone starts to respond. Step 3: When the Samsung Galaxy S7 Edge shows on the screen, release the Power key but continue holding the Home and Volume Up keys. Step 4: When the Android logo shows, you may release both keys and leave the phone be for about 30 to 60 seconds. NOTE: The “Installing system update” message may show on the screen for several seconds before displaying the Android system recovery menu. This is just the first phase of the entire process. Step 6: Once highlighted, you may press the Power key to select it. Step 7: Now highlight the option ‘Yes — delete all user data’ using the Volume Down key and press the Power button to select it. Step 8: Wait until your phone is finished doing the Master Reset. Once completed, highlight ‘Reboot system now’ and press the Power key. Step 9: The phone will now reboot longer than usual. You can now setup your phone again. Solution: Hi Feinex333. Although we are not ruling out the possibility that you are very unfortunate to land three Samsung devices with bad hardware, statistics-wise, overheating issue that results to a cracked screen is almost unheard of. Overheating can be caused by a lot of things so it’s difficult tell what’s going on with your devices with the information you provide here. Some of the causes has something to do with phone care so it piques our interest how come three flagship phones keeps on overheating in the same household. We are not accusing you of mishandling your smartphones but as a friendly reminder, always make sure that you don’t leave your phone near a heat source like an oven, furnace, expose it to direct sunlight, or leave it inside a hot car. Another possible cause that we can think of, since at least three devices have the same symptoms, is a problematic app. Did you happen to install the same set of apps on the phones, or is there an app common to all of them? You may have installed a bad app that may have, in turn, spread a malware that causes the phones to overheat. Again, this is just speculation since your problem description is hardly helpful but it’s a good way to keep your troubleshooting going. If an app is to blame, the same issue may be repeated even if you’ll not use a Samsung device in the near future so it’s worth checking at this time. This is assuming of course that the problem is not hardware in nature. For resolution, we suggest that you contact your service provider (again) and demand for a replacement. There’s nothing that you can do about the cracked screen at this time. You either have to invest in a new phone or simply throw your phone as an expensive paperweight. Hi. I believe my new Galaxy S7 phone has either a bad memory card reader or a software issue that is preventing 32GB Micro SD cards from being recognized. I have tried 3 different cards. However, these same cards do work in my daughter’s S5 phone. Additionally, her own card that works in her S5 will not work in my S5. Lastly, I even took my new phone to a local Verizon store to see if they could figure out the problem. They also could not get any of the cards to work in my new S7. I am on PagePlus Pre-paid Service which uses Verizon’s towers so I had to get a Verizon compatible S7 phone. I tried my current 32GB Micro SD Memory Card that I use in my former phone (Galaxy S4). It is not recognized by the new S7 I received from you. I tried a brand new 32GB Micro SD Memory Card in the new S5 I received from you. It does not recognize the card. My daughter has a Galaxy S5 phone, so I tried my daughter’s 32GB Micro SD Memory SD Card that she uses in her S5 phone and that will not show up in my new S5 phone either. I took the cards in steps #1 and #2 above and placed them in my daughter’s S5 phone and the both ARE Recognized by her phone. They work fine. I drove to a Verizon Dealer, located at BJs Warehouse in Derby, CT. I spoke with Dave. He tried both my Micro SD card that I was using in my old S4 phone and the new Micro SD card I just bought. He verified that neither card will show up (recognize) in my New S7 phone. Solution: Hi Fran. It’s clear from all the steps you’ve tried that your phone is the problem. We don’t know what your expectations are but there’s no special trick that you can do on your phone to make the SD card reader work. The best thing to do in this case is to have the phone either repaired or replaced. I left the phone in a downpour of rain for a good minute or 2. When I brought it in, I took case off and dried it off with a towel and then I shut it down and put it in a bag of rice. I watched this phone turn itself back on and make a call. The screen would flash on and off. I turned it off again and a minute later it went into the BIOS Screen and booted back up in safe mode and then it flashed on and off again. I tried to shut it down but it took a few minutes. After a few hours (5) I took it out of the rice and laid it on the bed to see what it would do. I turned it on but could take tell cause the screen stayed black but the bottom buttons next to the home button would light up. Someone called me and it rang but no screen. So I just pressed the home button to answer and I was on a call. I then tried to boot it up in safe mode which was difficult with no screen, still black with phone powered on. I finally got it in safe mode and it was back to factory settings, telling me an unusual reset was performed to activate the phone again. Oh and also right after it got rained on it said WARNING A CUSTOM OS CAN DAMAGE APPS…you should know the rest. Solution: Hi Wesley. We’re afraid your phone is most probably trashed. If you’re lucky, you may be able to get it back to working order after a phone replacement (if water damage is only limited to the screen assembly). In an ideal scenario, you were supposed to open the phone up right away, removing the battery and disassembling major components so you can thoroughly clean and dry everything. 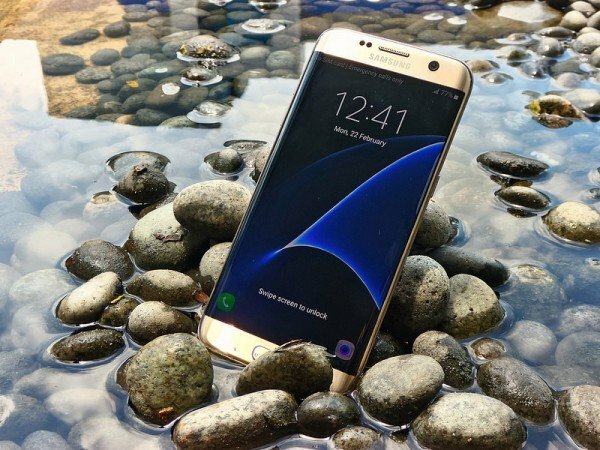 We know battery removal for an S7 is out of the question so there’s really nothing that you can do about it anyway. Also, the main purpose of leaving a wet electronic device in a bag of rice is to ensure that you give moisture enough time to be absorbed by rice. This process can’t be done under a few hours. You have to leave the device inside the bag for at least a week. That this was never done does not improve your situation at all. Right now, the only thing that you can do is to bring it to local repair shop so it can be cleaned, dried properly, and repaired. Hopefully the device will work after a screen replacement. If nothing changes after a screen replacement, simply find a way to have it replaced. My phone is cracked on both the front glass and the back glass. It overheats and now it got too hot and it froze then shut off what should I do? P.S my parents only know about the front crack. My S7 camera just all of a sudden stopped working. I did all the troubleshooting to no avail. Took it to a Verizon store, they did everything I did but also reset the phone. Camera still didn’t work. I took it to Best Buy, where I got the phone, to the Samsung dealer. He tried too, and also called Samsung, who were no help at all and told me to send the phone in. When I was prepping the phone, I noticed a crack on the back, down near the bottom. I have no idea when or how it got there and the overheating issue makes perfect sense to me. It has been overheating regularly. Especially if I am using it for the GPS, so any time it is being used while being attached to the charger. I want to send it in for repair or replace under warranty, for the camera issue. The phone is 5 months old and the camera shouldn’t have stopped working. I am concerned they are going to deny the warranty service because of the crack on the back of the device. This is my 3rd Galaxy and all have had issues with overheating. My galaxy s7 overheated to the point that it cracked as well. It’s not unheard of just go look at samsungs comments on facebook it’s happening to many people samsung is just not taking accountability for their faulty products I already switched to IPhone because of this issue just had to stick up for that person who is saying it happened to them.